We still have a few weeks of summer left and dang if I’m not going to be all bright colored and fun until the end. 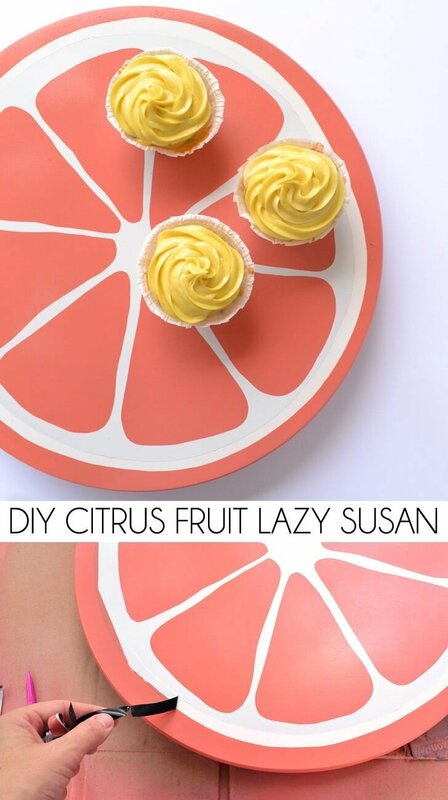 After a recent trip to IKEA I came home with tons and tons of inexpensive goodies to DIY on up. 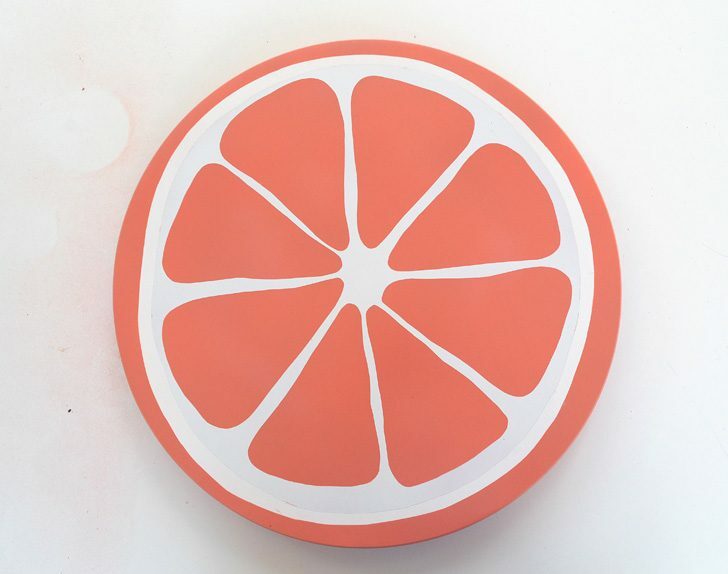 One of the things I came back with was an $8 lazy susan that needed some fun color and crafty attention. 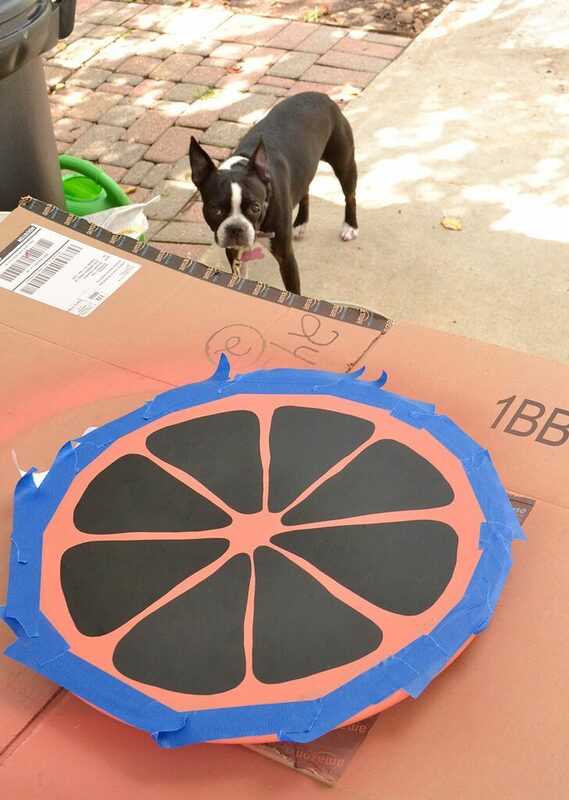 Grab a citrus colored can of spray paint and a roll of vinyl and let’s hop on this, shall we? Scissors, pencil, scrap paper, etc. 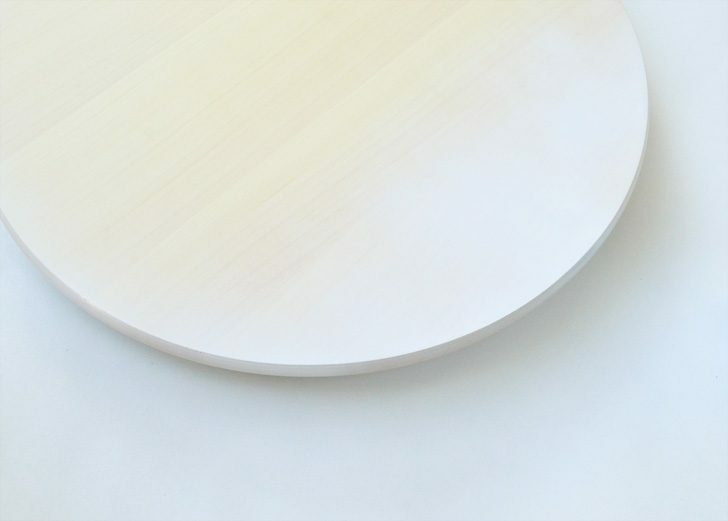 If you’ve never experienced the serving goodness that is a lazy susan here is a quick run down. 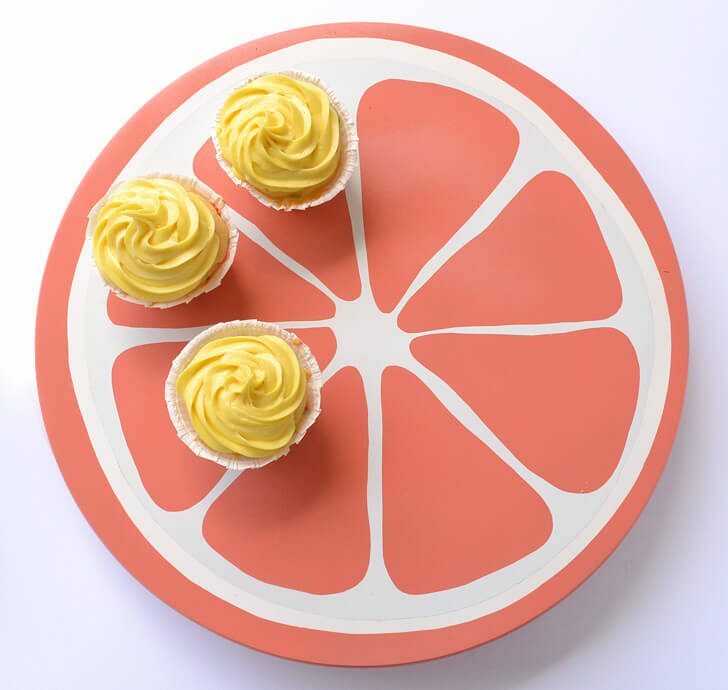 You’ve got a top platter that rests on top of a base that allows the top to spin. 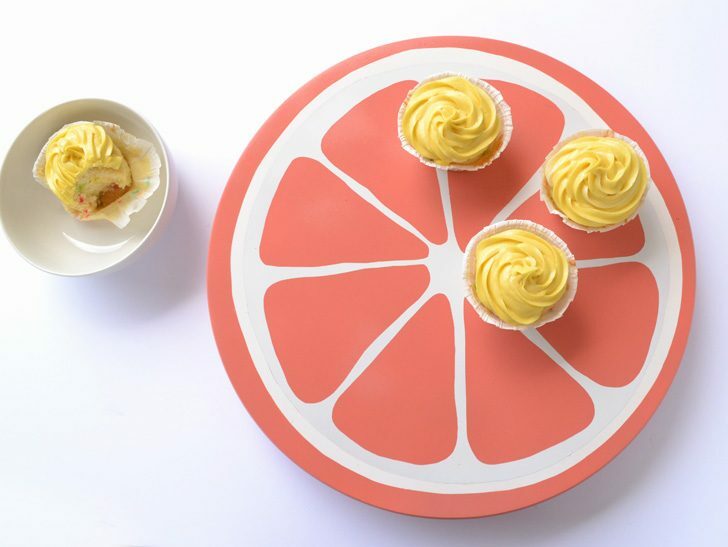 It makes serving things around a table (especially a round one) much easier. Now, you’ll first need to tape off the base of your susan to keep it from getting sprayed with paint. The last thing you want is bright ol’ spray paint rubbing off on your fancy table when the platter gets pushed around. 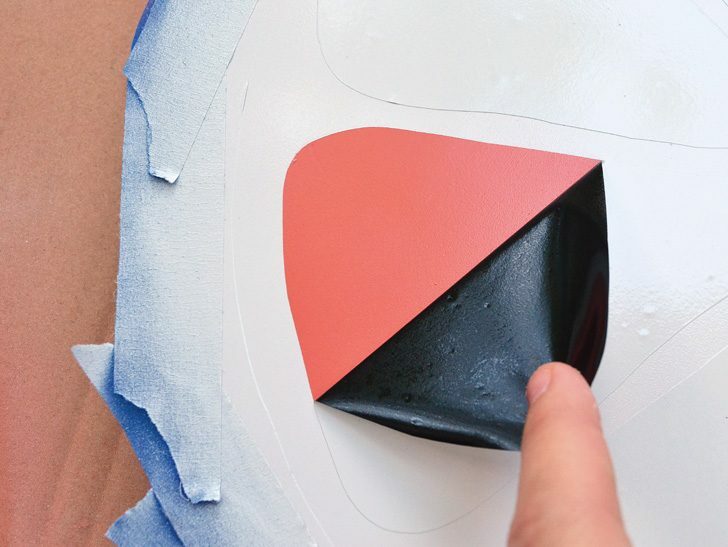 If you’ve got really great spray paint you can probably skip this step, but I always feel better priming things. 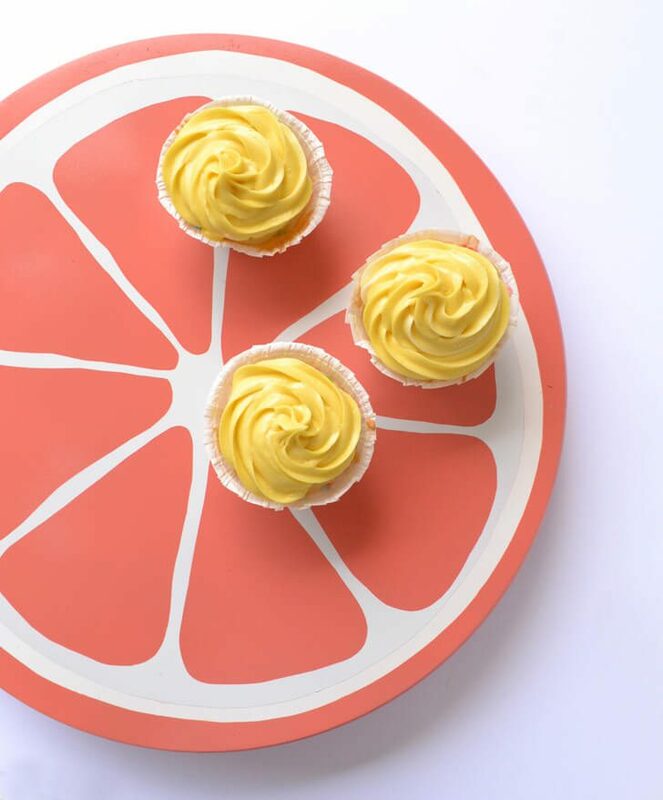 Spray on a base coat of your citrus color following your primer if used. Now I wanted my fruit to be more “natural” and less perfect. That’s to say I didn’t want perfectly shaped and sized pieces perfectly spaced apart. Instead I wanted things to be more like a natural grapefruit would be. Different shapes, none perfect. 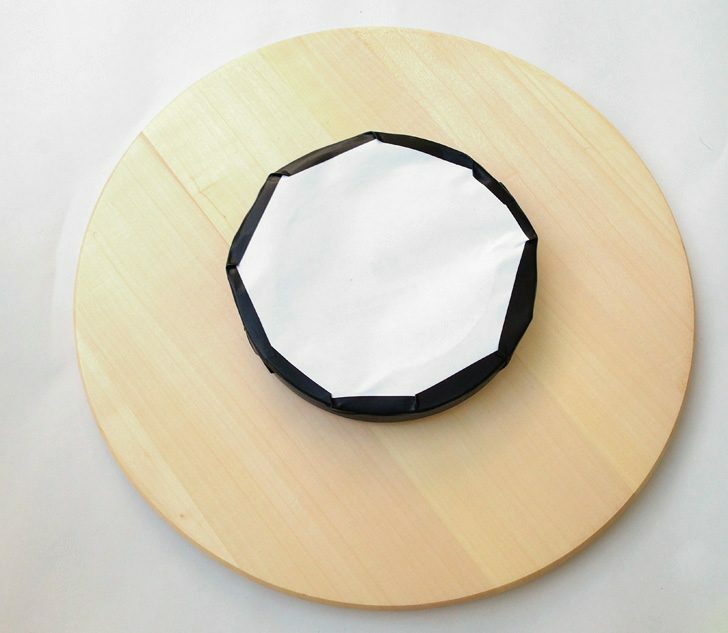 To do that I grabbed an old piece of posterboard and cut out an imperfect circle to fit inside the center of the susan. Use anything large enough that you have. 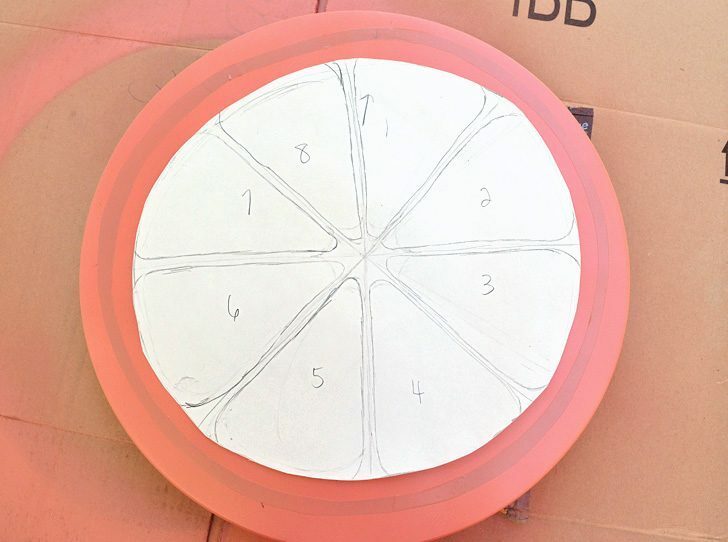 Draw your 4 guide lines to make 8 pie shaped pieces. Inside of each piece sketch out a shape that isn’t exactly like any of the others. To keep things from getting to confusing, number your pieces so they stay in order, especially if you crossed over a line or two (and I did). 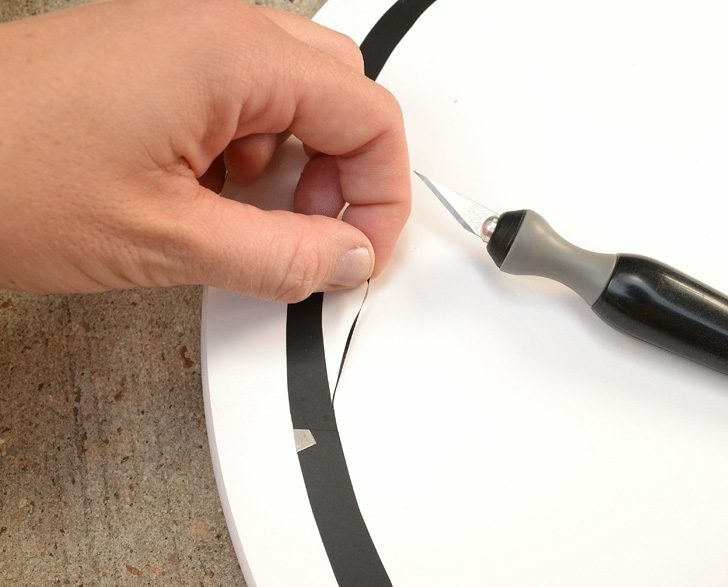 Cut your scrap pieces out and use as templates to cut out pieces of adhesive vinyl. 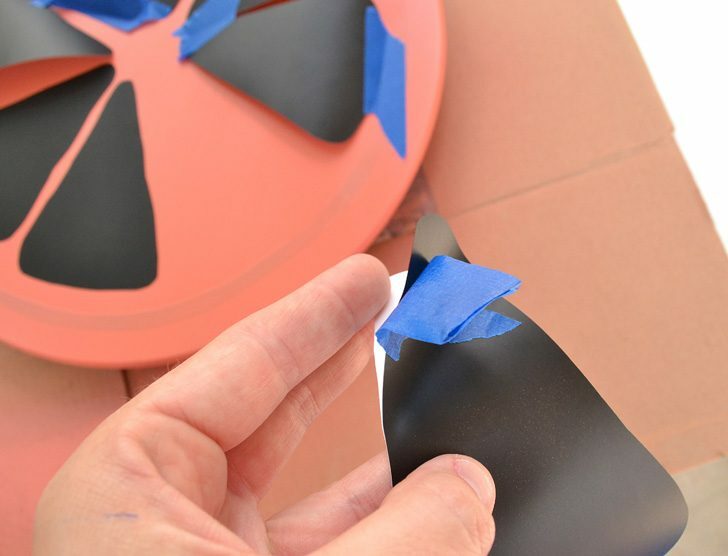 Lay your vinyl pieces out as they should be and use pieces of masking tape if necessary so that you can keep things where they need to be. FIRST BE SURE THAT YOUR PAINT IS SUPER DUPER DRY AND THEN remove the paper backing and stick the vinyl down to the top of the lazy susan. Quick tip, since I have no fingernails I can’t peel away the vinyl by separating like that. Instead I grab a piece of masking tape and put it on the top of the vinyl piece and over so that part of the tape is hanging off of the side. Then I use the tape to pull the vinyl back from the paper all easy peasy like! Now I’m not sure what I was thinking, if anything at all, but I taped off the peel right after I primed my piece. So in the end my pith around the citrus wedges is really big, and only part is nice, bright white. Ah, well. Mistakes happen! Now go over the top of your piece with really good, white spray paint with primer and allow to dry. This is Rustoleum and I swear it’s the best I’ve ever used. The can says 2X on it and this is white gloss. One coat and you’re all covered and good. Boom! 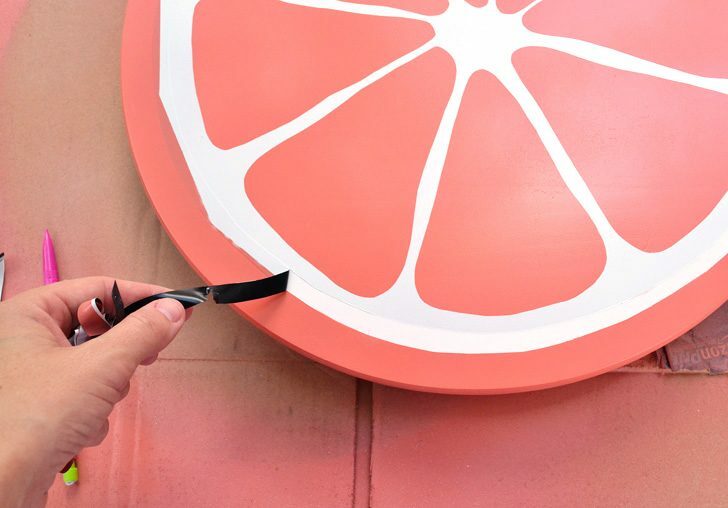 After the white paint has dried remove your vinyl and tape to reveal your citrus shape! Finish with a few coats of protective spray like polyurethane to protect the surface and make it super easy to clean. 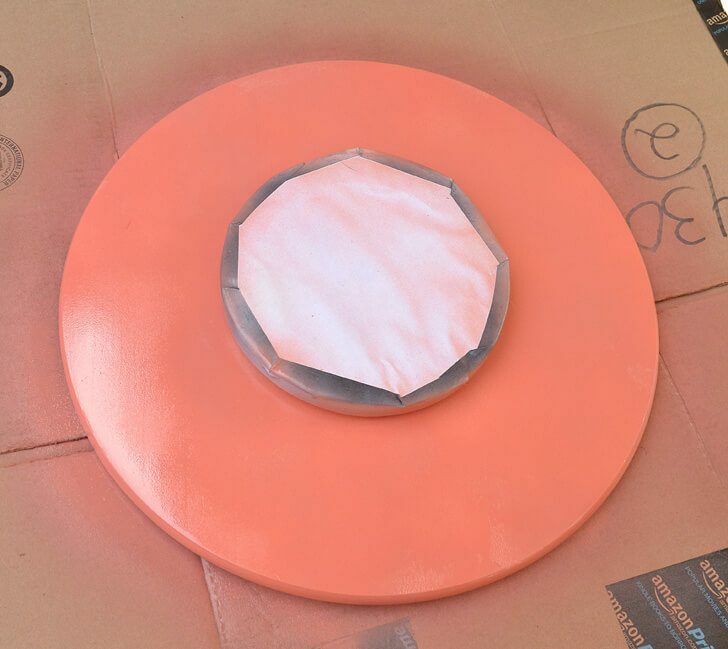 After that coat dries, remove your protective paper from the bottom portion and after allowing to cure for a few days, your lazy susan is ready to be put into action! I LOVE this thing SO, SO much! It’s amazing what a little bit of spray paint can do, isn’t it? And all in all it was a super affordable little project. 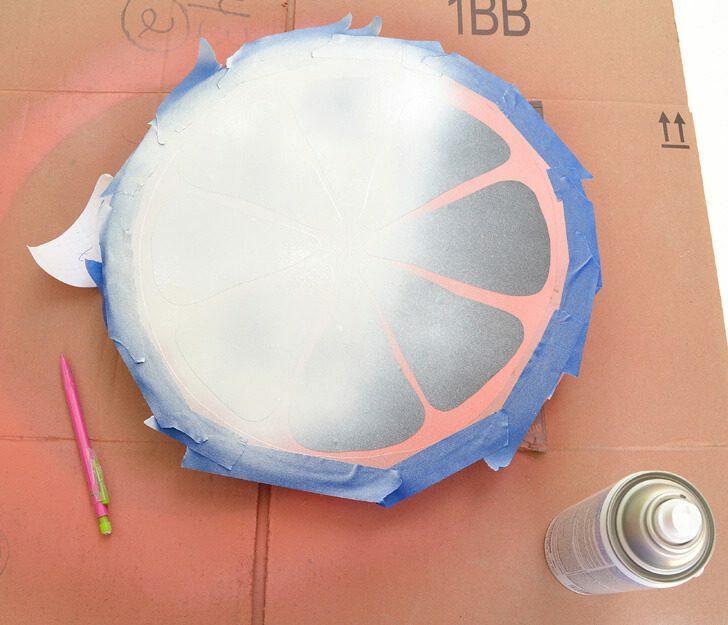 Good white spray paint is a must for any crafty stash and be sure to grab a citrus color you love and will use again and again and this whole project will be a great value.